Dolphins Smile For The Camera! I saw a great viral video recently containing footage from a fishing trip off the coast of Santa Cruz, CA. Mark Peters, the one who filmed the video, created a little torpedo capsule for his GoPro camera to get some underwater shots of the tuna him and his friends were fishing for. Little did he know how precious that GoPro would be when a pod of dolphins started swimming next to their boat… Check it out below! Isn’t it hard not to smile when you see a dolphin 🙂 ? Dolphins are such beautiful, curious, smart, and for the most part very friendly creatures. The Pacific White-Sided Dolphins as seen in Mark’s video are very common off the coast of California. 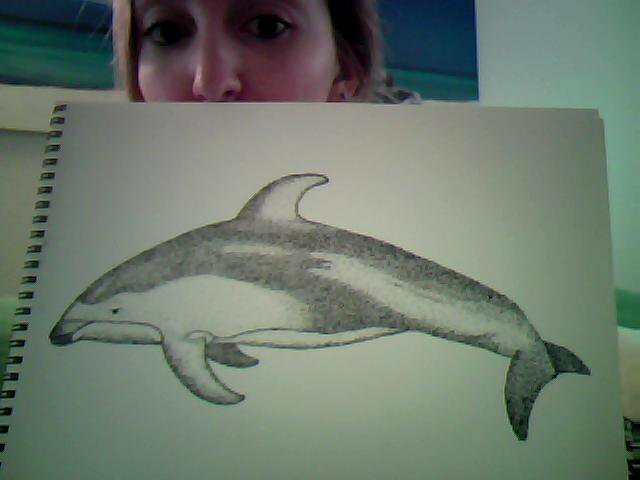 I actually did a little pointillism drawing a couple of years ago of a Pacific White-Sided Dolphin as seen below. It was a fun and relatively simple drawing to do 🙂 Hope all of you are enjoying your week thus far- keep smiling! You are welcome Julie- glad you liked it! Love the uncut clip part of the dolphins! It made my day!! Your drawing is wonderful!